The large vibrant 4.3 inch display, built-in kickstand, 3.5 mm headset jack and HDMI output make HTC EVO 4G an unparalleled platform for wireless entertainment. Download your music, your pictures, your files, and your videos in seconds – not minutes – and watch streaming video on the go on a network with download speeds that are up to 10 times faster than 3G speeds.1 With built-in mobile hotspot functionality, HTC EVO 4G also allows up to eight Wi-Fi-enabled devices, including laptop, camera, music player, video player and any other Wi-Fi-enabled device, to enjoy the benefits of 3G/4G speeds on the go. * Battery life: 6 hours of talk time. Time may vary depending on 3G/4G coverage and usage. 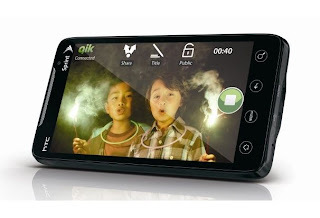 The HTC EVO 4G Smartphone is “Up to 10x faster” based on download speed comparison of 3G’s 600 kbps vs. 4G’s 6 Mbps. Industry published 3G avg. speeds (600 kbps-1.7 Mbps); 4G avg. speeds (3-6 Mbps). Actual speeds may vary. Sprint 4G is currently available in 32 markets and counting, and on select devices. Not all services available on 4G and coverage may default to 3G/separate network where 4G unavailable.Note: Device features, specifications, services and applications are subject to change.